How to use the product rule to find the derivative of the product of two functions? The Product Rule says that the derivative of a product of two functions is the first function times the derivative of the second function plus the second function times the derivative of the first function. What is the Product Rule Formula? 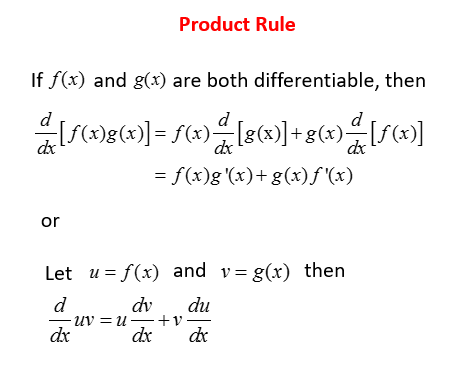 The following image gives the product rule for derivatives. Scroll down the page for more examples and solutions. How to use the Product Rule? Given f(x) = (3x2 – 1)(x2 + 5x +2), find the derivative of f(x). When to use the Product Rule? We use the product rule when we need to find the derivative of the product of two functions -- the first function times the derivative of the second, plus the second function times the derivative of the first. The product rule is related to the quotient rule, which gives the derivative of the quotient of two functions, and the chain rule, which gives the derivative of the composite of two functions. How to use the Product Rule for Derivatives? How to find derivatives using the Product Rule, Chain Rule, and Factoring?